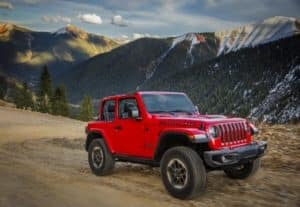 2019 Jeep Wrangler - What's new? " "
We’re only a single model year on from the launch of this latest new generation of the iconic Jeep Wrangler, so it’s only to be expected not a great deal is particularly new this year. Let’s face it folks, the Jeep Wrangler is a legendary icon of a vehicle and there’s only a certain amount of change it can take. We only have to look at the new-generation and compare it with the previous one to see the change there wasn’t exactly seismic either. That’s very much a good thing though, because there are a handful of vehicles out there where the style and design is so intrinsic to their popularity that a radical redesign could risk their ongoing popularity and even their long-term existence. So what is actually new for 2019? 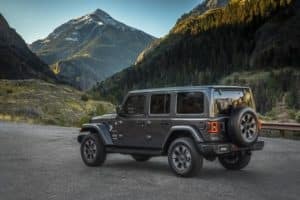 An advanced safety package which adds the likes of forward-collision warnings and adaptive cruise control to certain trim levels of the 2019 Jeep Wrangler has been made available as a cost option. Apart from the addition of the Bikini exterior paint color, really that’s about it. However, last year did see what for the Wrangler was pretty serious change, so let’s take a look at some of the highlights and why we should embrace some things staying the same. The one thing about the Jeep Wrangler that’s changed least over 40 years is the exterior styling, which is possibly the biggest reason for the vehicle’s enduring success. If you ask a small child to draw a Jeep they will probably sketch a very basic outline in crayon that’s immediately recognizable as a Wrangler. Jeep could, of course, completely redesign the Wrangler for the 21st century, but what would be the point? Any new buyers it might attract could be of little consequence as dedicated fans of the nameplate could turn away in droves. It’s simply not worth the risk, especially as there’s quite obviously so much love out there for the design just the way it is. If the way the Wrangler looks is most responsible for its success, the second most important attribute it has to keep appealing to buyers is its incredible capability. It might not have been the most city-friendly daily commuter vehicle in the past, but the new-generation has gone a long way to addressing those shortcomings without compromising the Wrangler’s imperious off-road ability in any way. Even in its standard form the Wrangler is sensation off-road, but spec it up a little and it can become as agile away from the pavement as a mountain goat. All Jeep SUVs are capable off-road, but the Wrangler is by far the most capable off-roader. To make the Wrangler with some of the more road-friendly compact SUVs out there, last year Jeep added new 8-speed automatic and 6-speed manual transmissions to the 3.6-liter V-6 engine we know so well. That’s just the start of it though as a new 2.0-liter turbo-four was also introduced which also features a 48-volt mild hybrid system to bring the Wrangler right up to date. A new electro-hydraulic steering system was also added last year to deliver much improved feel and engagement for the driver. Aside from the powertrain, the interior is probably where the Wranglers of old have been left behind and a new era has been ushered in. There’s a little more room inside than there has been before, the seats are better bolstered and more comfortable, and adjustable lumbar support is now a standard feature across the range. A new, lower dashboard doesn’t take up as much passenger space as the old one did, and the onboard technology and infotainment is now very much up to date. For more details and to check out a 2019 Jeep Wrangler for sale in Washington, MI, don’t hesitate to get in touch with us here at Orchard Chrysler Dodge Jeep Ram, your premier choice Jeep dealer in Washington, MI.